Athens, Ga. – Researchers at the University of Georgia used a common dog disease-canine parainfluenza-to build a new vaccine to protect humans and animals from the rabies virus. Developers hope the new treatment will reduce costs and increase accessibility to a vaccine for a disease that currently kills 55,000 people a year, according to the World Health Organization. Current rabies vaccines use weakened pathogens to develop resistance. UGA professor Biao He’s technique is different. Using genetic engineering, he and his team of researchers inserted a non-viral piece of the rabies virus into parainfluenza virus 5, called PIV5, which a virus that causes respiratory infection in dogs. Using PIV5 as a delivery mechanism to expose humans and other animals to important pathogens-rabies in this case-allows them to create antibodies that will protect against future infections. 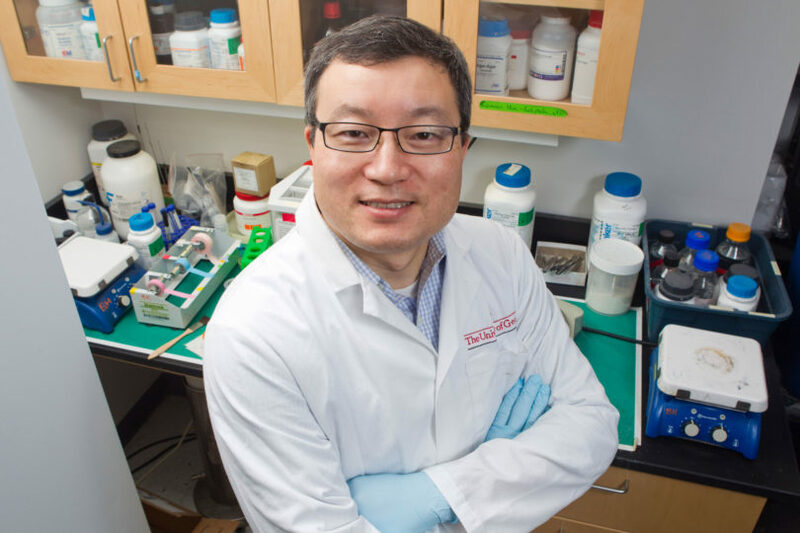 “This could be man’s new best friend in delivering vaccines,” said He, who is a professor of infectious diseases in the UGA College of Veterinary Medicine and the study’s lead author. According to results recently published in the Journal of Virology, the vaccine is effective in building immunity. The study tested the efficacy of the drug on a mouse model when administered orally, through the nose and into muscle. When the mice were administered a lethal dose of rabies, survival was 100 percent when they had received the vaccine nasally or into muscle. Survival was 50 percent when the vaccine was administered orally. In the U.S., rabies are seen most often in wild animal populations. The Centers for Disease Control and Prevention reports an average of two human deaths per year from rabies in the U.S. While death rates in the U.S. are low, rabies is expensive to control. The CDC estimates the disease costs more than $300 million annually, costs that include the vaccination of companion animals, animal control programs, maintenance of rabies laboratories and medical costs. Humans at risk for contracting rabies, like those who work with wild animal populations, even if immunized need booster shots after the fact if a rabid animal bites them. Humans infected with rabies who have not been vaccinated pay high prices for medical treatment that is time consuming and painful. He is hopeful the new vaccine will be more effective and will require less of the drug to create resistance, reducing the cost. Initial results from canine tests look very promising. He hopes the vaccine will be available for animals in three to five years. Human vaccines will take longer. He’s lab also is working on vaccines for HIV, tuberculosis and malaria using this technology. “That is the fun part of science: You come up ideas, and of course it takes a long time to push it through, and sometimes what you thought would work doesn’t, but sometimes it works out really well, and that is really exciting and fun,” He said. Contributing authors include, Zhen Fu, Zhenhai Chen, Ming Zhou, Xiudan Gao, Guoqing Zhang, Guiping Ren and Clement W. Gnanadurai. An abstract of the article is available at http://jvi.asm.org/content/early/2012/12/19/JVI.02886-12.abstract?sid=5cbc8359-9c7c-41c1-b86b-dafd8af65f51.